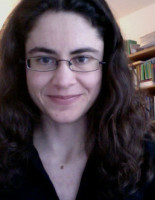 After having finished studies of philosophy, psychology and pedagogics in Athens, Georgia Mouroutsou started a PhD in Tübingen on the Metaphor of Mixture in the Platonic Dialogues the Sophist and the Philebus. After a two-year-old academic stay at Cambridge University, which was funded by Fritz Thyssen Stiftung, she elaborated further on her monograph on chora (estimated completion in 2011) and investigated its reception in Middle Platonism in Berlin. Her PhD has been published as the Vol. 28 of the International Plato Studies. The philosophical issue that has come to the fore since her PhD is the Aristotelian influence upon very important decisions in the immediate course of the history of philosophy. For now she focuses on the reception of chora (in Middle Platonism).